Click here to continue to January, 2007. Today, I laid out and installed the field tile on the bathroom floor. For the floor tile, we chose a traditional mosaic tile in a 1" hexagon pattern, in a warm white color. To spice things up a bit and add some color, we chose some bayberry hexagons (sage green) that I planned to randomly distribute using a technique that I had once seen and which had captured my interest at the time. 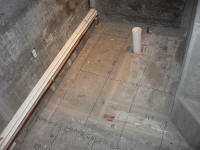 I began with layout, once I lugged the 6 boxes of 1' x 2' tile sheets up from the basement to the second floor. I needed to see how the sheets of tile would lay out in relation to the various walls and obstructions. Starting at the doorway, I laid full sheets against the door jamb, and against the left-hand wall. 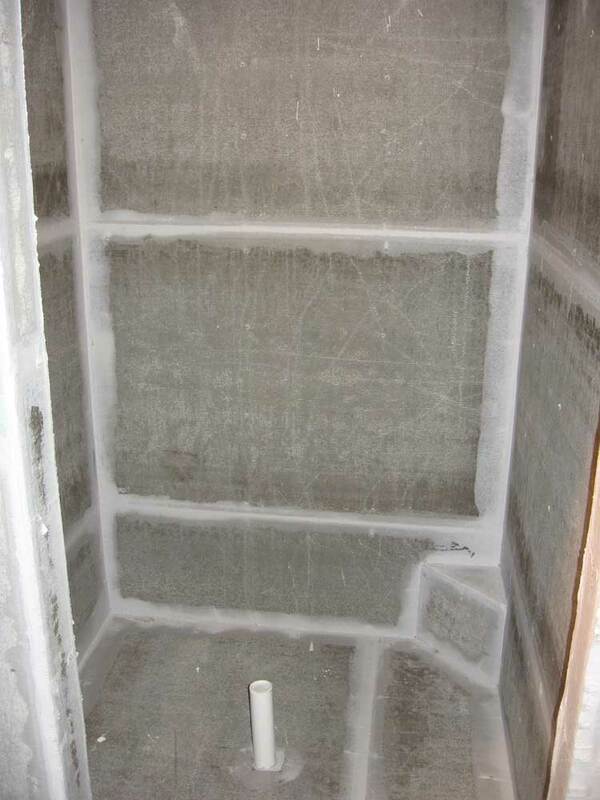 The shape of the tiles meant that there were no straight lines of tile on any side of the sheets, eliminating the possibility of clean edges at the wall and guaranteeing a large number of cut tiles in my future. 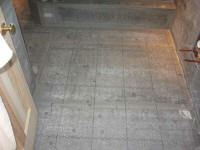 I laid the tiles towards the bathtub surround, at which time I discovered a need to change the spacing somewhat. Thus is the reason for the dry layout. 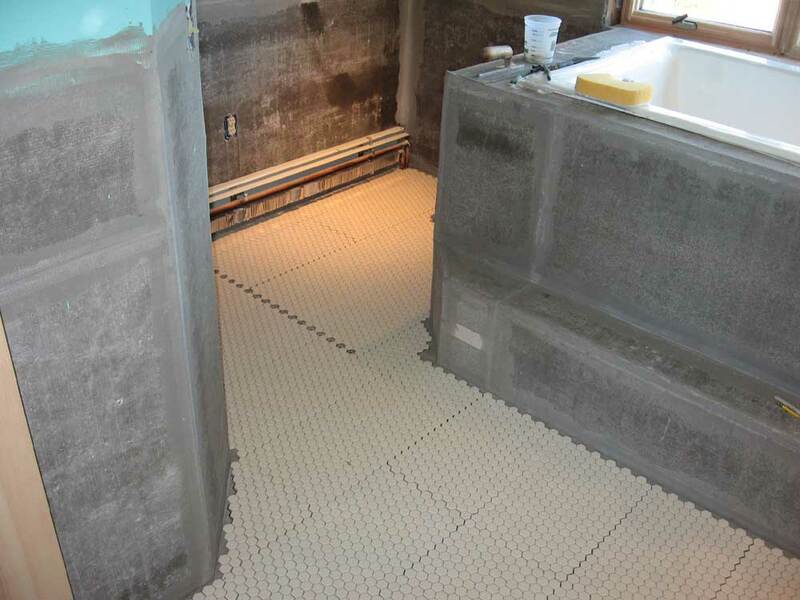 From there, I laid out tile sheets in either direction, towards the righthand wall and around the corner of the tub towards the toilet enclosure and shower area. I adjusted the original placement as needed to optimize the way the sheets fell in these other areas. Once I felt that I had a handle on how things were going, I drew some layout lines on the floor, tracing the edge of some of the sheets. 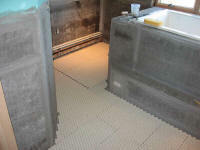 The straight line of missing tiles you see here is where I offset the tile sheets going into the toilet enclosure, since offsetting them one tile made the full sheets work much better against the edge of the tub surround to the right. Those spaces will be filled with white field tiles during installation. Before long, though, I decided that it might make the most sense to just lay out the entire floor, cut the sheets of tile as needed to fit (leaving the small cut tiles around the edges for a different day), and mark all the sheets, since it would streamline the installation process and would also make marking and installing the color accent tiles easier. So I spent the remainder of the morning laying out all the sheets of tile and covering the floor, including cutting partial sheets to fill in at the edges. All that remained were the tiny cut tiles that I'd have to do around the edges later on. I laid sheets of tile beneath the area where the vanity cabinets would go, but only after I determined that I had more than enough tile remaining to do the shower floor and tub step later on. 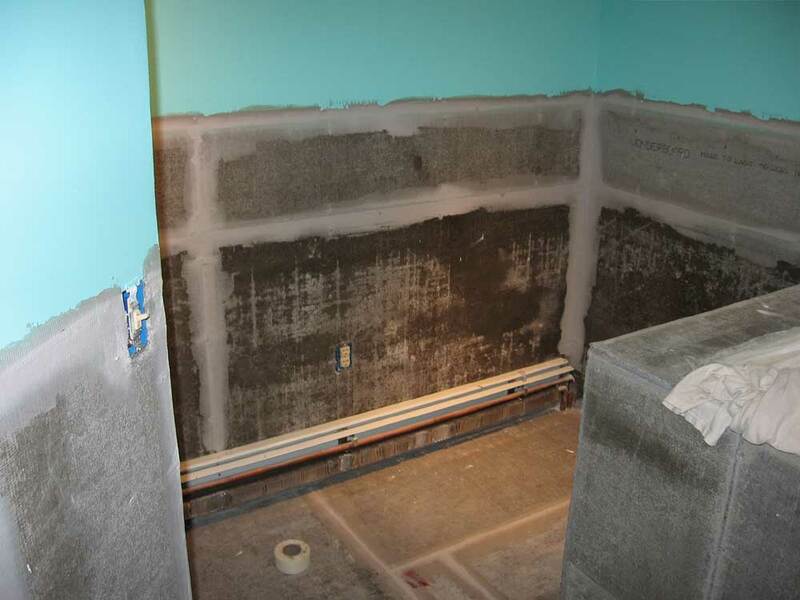 Tiles aren't necessary under the cabinets, of course, but having a few sheets in place meant that it would be easier to install and level the cabinets. I didn't bother with the narrow strip right against the wall, though. 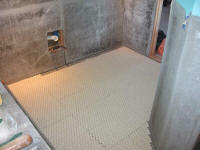 Once all the white tiles were laid out over the entire floor, we had some fun. I wanted to create a completely random scattering of colored tiles, so to accomplish this we tossed some quarters onto the floor willy-nilly, marking each tile where a quarter landed. 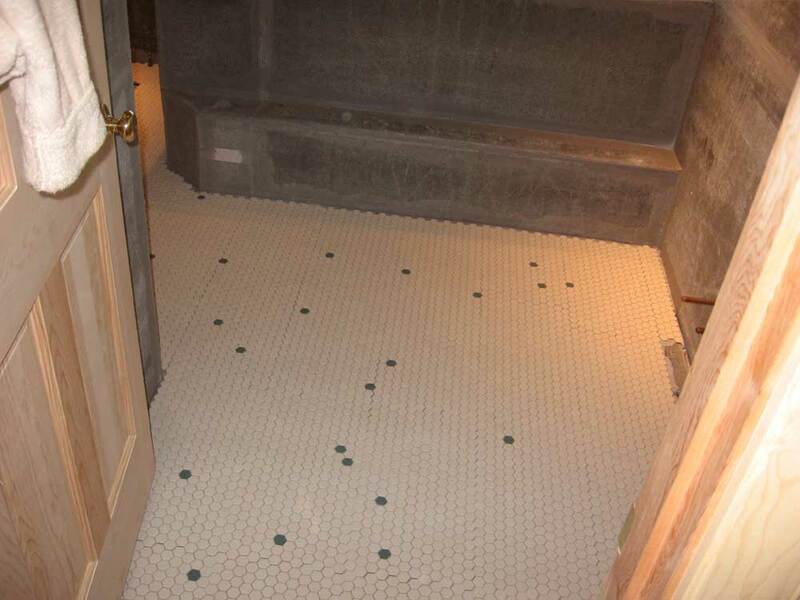 These would be the tiles that I would remove and replace with the bayberry green accent tiles. We marked about 35 accent tiles, which seemed about right. There was no rhyme or reason to where these tiles were located, and I was pleased with the randomness of the locations. (I keep wanting to call it a "pattern", when it's actually the antithesis of a pattern.) 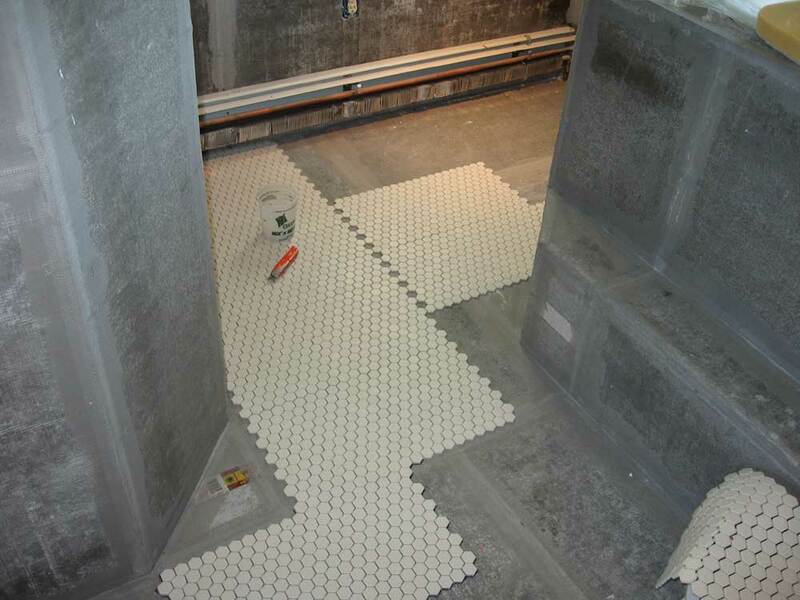 Again, note that the straight strip of missing tiles will be all white and invisible in the final installation. Once the coins were down, I marked the tiles on which they landed (when the coin spanned two or more tiles, I marked the one that had the most of the coin on it), and then cut out the tiles with my utility knife. Then, I outlined the openings on the floor for good measure before lifting each sheet off, numbering it, and marking the floor accordingly for reference. This left me with a detailed tile plan drawn on the floor, which was overkill--and the lines would get covered with the thinset mortar during installation, making them of only marginal use--but it seemed that this had been the best way to approach this particular job, given the situation and odd shape of the floor at hand. Before continuing with the tile, Heidi, Bob, and I drove up to a nearby stone place so that we could pick the stone we wanted to use for the inside of the fireplace and hearth. In our typical way, Heidi and I found a stone that we liked--and that Bob said would be workable for the area in question--in short order and definitively, and we bought the pallet of stone on the spot. 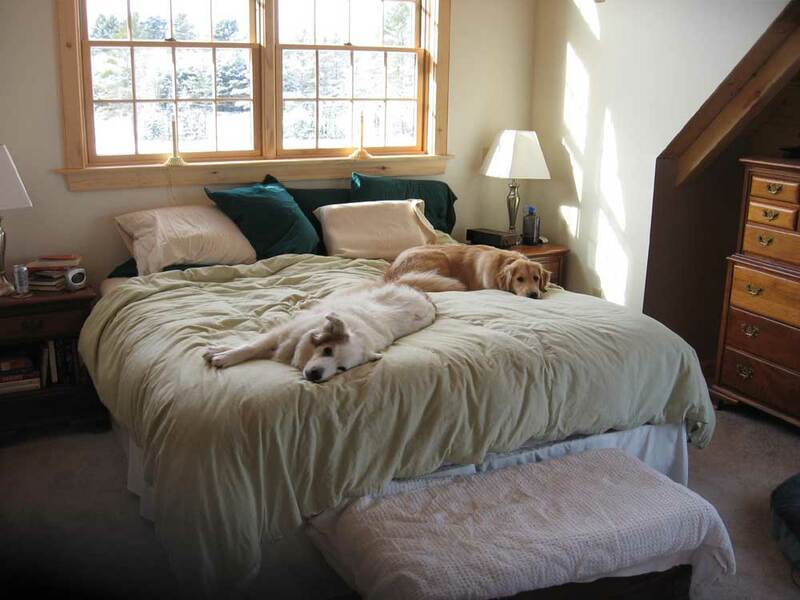 We are most fortunate in that we tend to agree on things quickly, which has certainly made the whole house construction far more straightforward than it might be for many couples. We'll go and pick it up later on. No pictures, sorry. With that, I was nearly ready to install the tile. First, I took a putty knife and scraped up any blobs of mortar or joint compound that were on the floor, and swept the floor thoroughly to remove dust and debris. 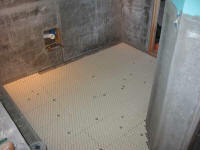 Then, beginning in the furthest corner behind the toilet, I began laying the tile. I used a 3/16" V-notch trowel to spread the mortar. 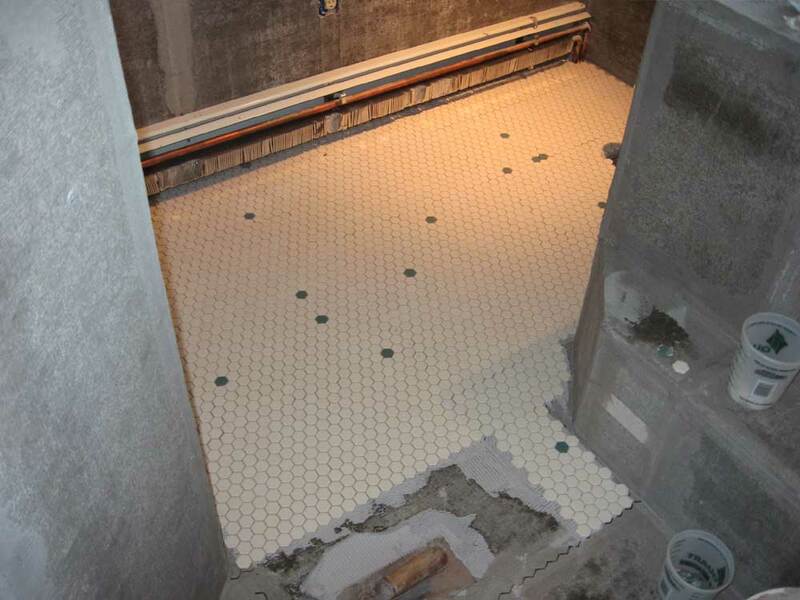 One problem with mosaic tiles, which I had first experienced in the downstairs bathroom, is that they require so little mortar, and there are so many joint lines (and small ones, at that) that excess mortar tends to fill many of the grout lines. 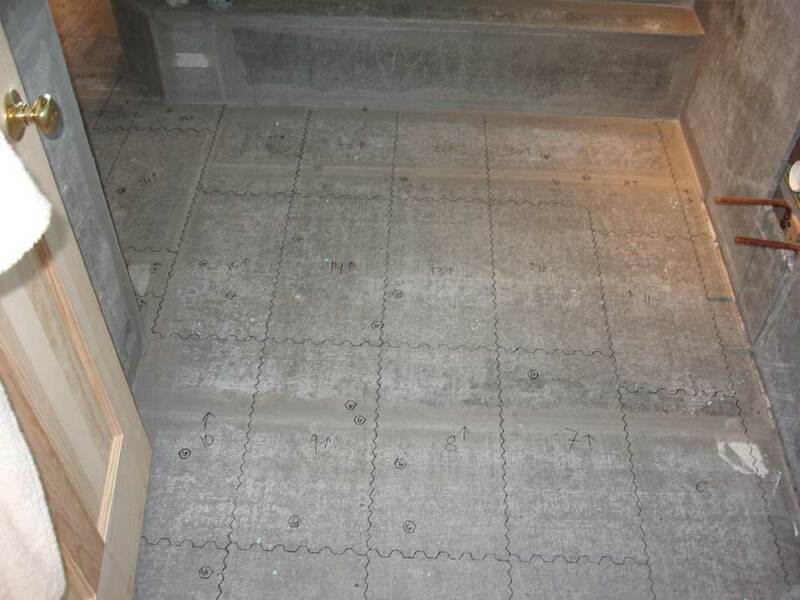 I was better prepared for this eventuality here, and made all efforts to minimize the amount of mortar on the floor, and to avoid pressing the tiles too deeply into the mortar bed, which tended to cause the mortar to fill the grout joints. 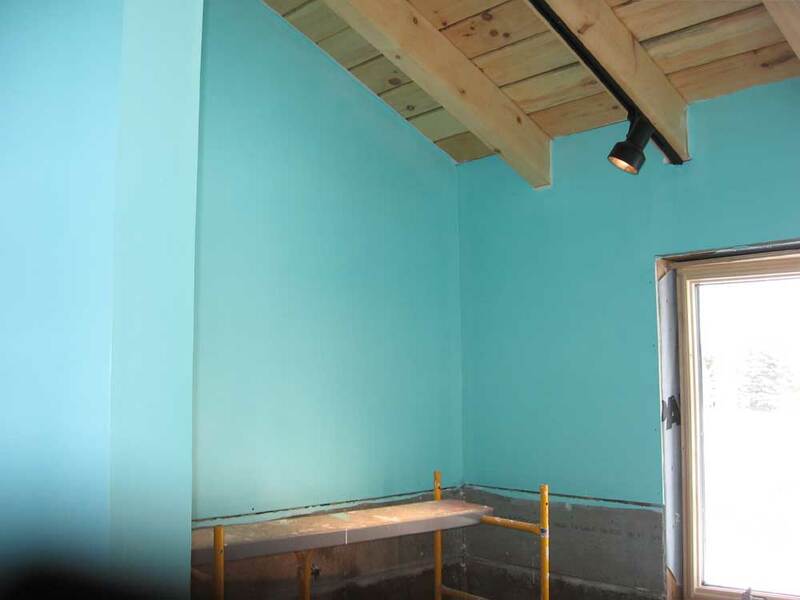 I used a wet sponge as needed to push the mortar into the joints and leave room for grout later; fortunately, our grout is nearly the same color as the mortar. I worked my way through the room, installing the sheets and single colored tiles as needed. I also filled in a few areas near the walls with additional single tiles (field color) wherever they would fit. Laying the tile in the entire room took about two hours. While I was laying the tile, Heidi went out and picked up a couple boxes of colored tile that had come in since yesterday, which completed the order we needed for this room. Next: lots more tiling ahead, including cutting and fitting all the tiny tile pieces around the edges of the floor. I'm still not quite sure how I'm going to cut 1" tiles in half (or smaller). The way will eventually become clear, I'm sure. I ran errands this morning and picked up additional thinset, mastic, and grout for the bathroom, as well as most of the tile for the walls and showers. By the time I got home and got all this unloaded, most of the morning had gone by. Some of the areas that I mudded yesterday were still uncured, since it had been cold in the bathroom, so the floor wasn't ready for tile just yet; I preferred to wait to give the thinset a chance to dry completely. 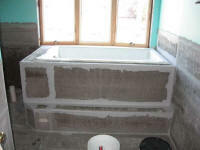 So rather than press on with the tiling, I finished up the small amount of seam taping required around the tub surround. This job was straightforward except for when I put my hawk on the edge of the tub for a second. Of course the heavy mortar flipped the thing right off the edge and onto the floor, where it landed upside down. Sigh. 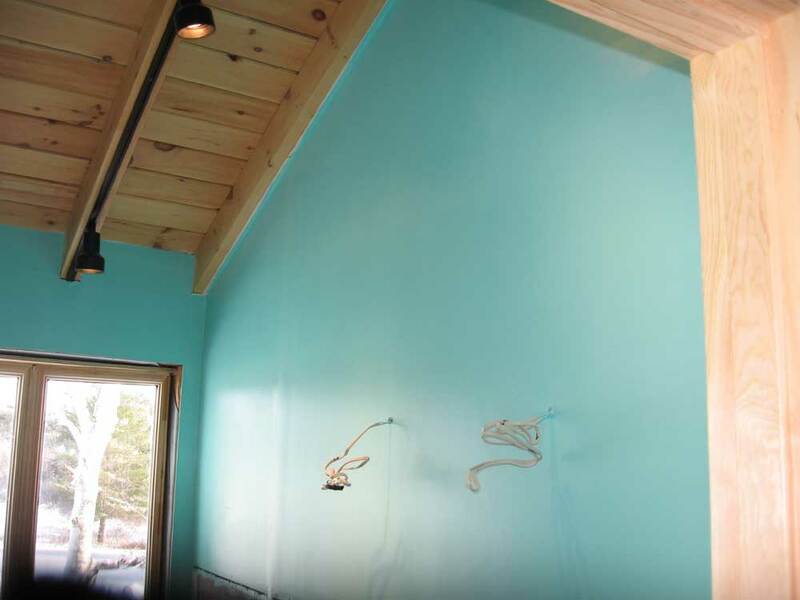 Once I finished the mud, I worked on a few small items on my punch list inside the house--items of such insignificance that they hardly bear mentioning here, so I won't. It's all part of the process, and also worked very effectively to allow me to keep avoiding the project that really needed doing, but that I had no motivation to actually do: install the railings on the stairs. 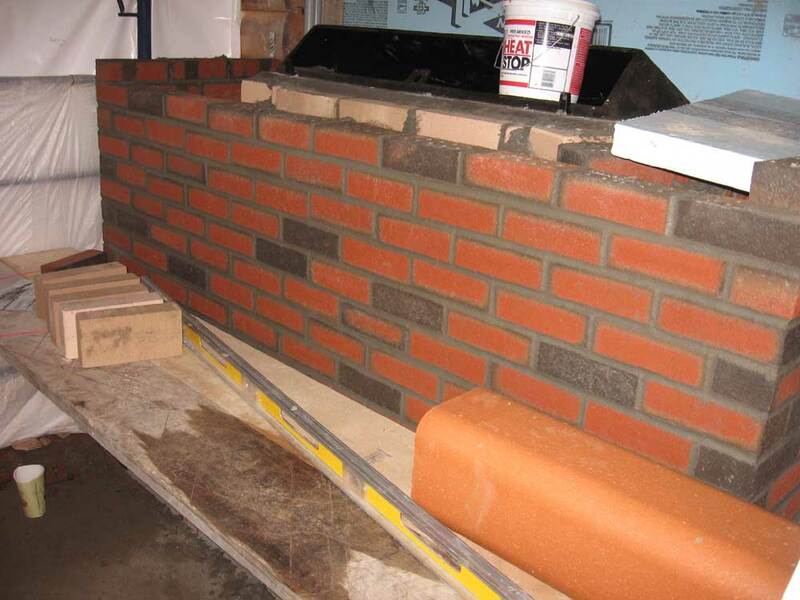 I made minute progress in this direction, though, when I loaded up the pine 4x4 and 2x4 lumber slated for the job, which I had stored in the basement for some time, and brought it down to the shop so that I could sand and mill the pieces as required to prepare them for installation. It's a small step, but one that seemed to indicate that I might not put this job off forever. Taking advantage of a bright, sunny afternoon, though finally a seasonably cold one, I decided to work on the Internet wireless bridge system that we had roughly installed a couple weeks ago. Both the sending unit and the receiving unit had been temporarily installed at that time, but it was time to do something permanent, which I expected would greatly enhance the performance of the system as well. In order to mount the receiving antenna for the wireless bridge network outside, I needed to run the POE (power over Ethernet) cable for the antenna out of the basement and to wherever I planned to mount the unit. 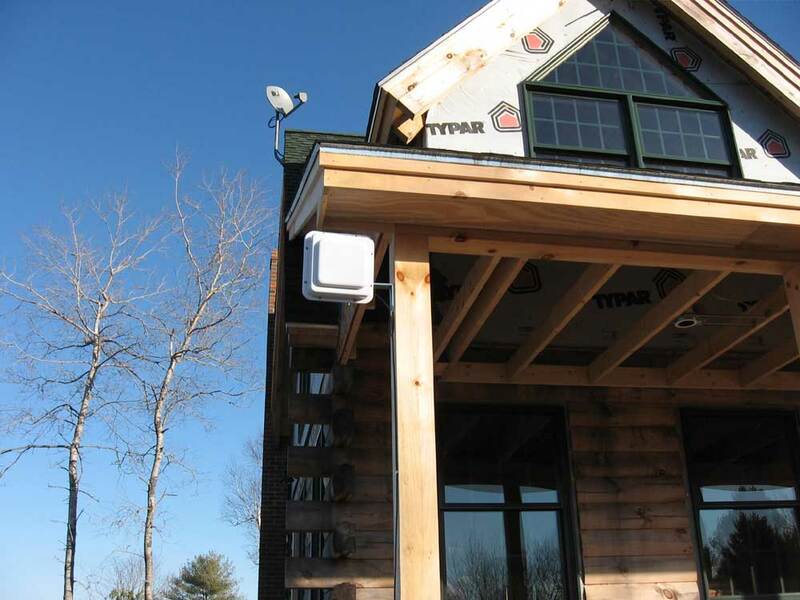 There was really only one location for the antenna, in order to maximize its exposure to the signal from the distant barn: on the front corner of the house, and probably on the porch post to allow the antenna to be somewhat protected from sun and weather. So I chose a location for the wire, and drilled a hole out through the box sill. I ran the cable out, and moved outside to mount the antenna. The antenna had a pretty slick and easy-to-use mounting system, so mounting it was quite simple. I screwed a bracket to the post in the appropriate position--about as high up as I could and still allow the antenna to slide over the bracket--and then secured the antenna to the bracket with the included hardware, a simple clamp-type device. I aimed the antenna by eye down to the barn. The corresponding antenna at the barn was still temporarily located inside, shooting out an upstairs window, but I planned to move it later to the exterior corner of the building, which would give the two antennas an unobstructed view of each other for optimum performance. Once this was done, I secured the cable appropriately, and then sealed up the hole in the box sill with some silicone. I left some coils of extra cable outside to allow for repositioning of the cable if necessary, or even a moderate repositioning of the entire antenna, without needing to destroy the seal through the house wall. However, there was a significant amount of extra cable available in the basement should it ever be required (the cable is 75' long). The cable passes through a pretty nice (and easy to use) weatherproof connector where it attaches to the antenna unit. I thought the antenna move made an appreciable difference in the speed of the Internet connection at the house, and figured that a similar move of the transmitting antenna down at the shop would really make a marked difference. 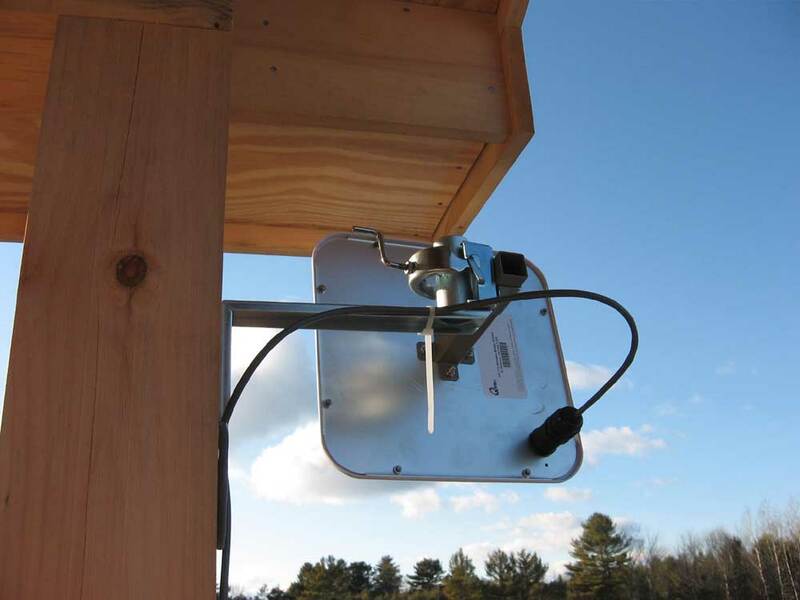 For now, however, I had to leave that alone, since I saw no reason to move that antenna when the corner of the barn where I wanted to mount it was now in the shade as the sun rapidly sank in the sky, and was subjected to the icy wind. With shade and cold wind not the best combination, I decided it would be better to attack that on some other day. OK, perhaps not the most productive day ever. 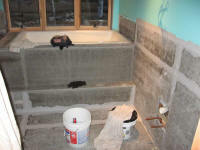 I decided to focus my energies on completing some house projects during the week between Christmas and New Years. The sporadic approach was becoming frustrating, and I hoped that I could really make some progress with a more focused approach. I got to work this morning with the mud and tape for the seams between the pieces of cement backer board in the upstairs bathroom. I needed to get this done before I could think about tiling. We had had the floor tile in stock for some time, and the wall tile that we ordered before Christmas had arrived at the store and was awaiting pickup. 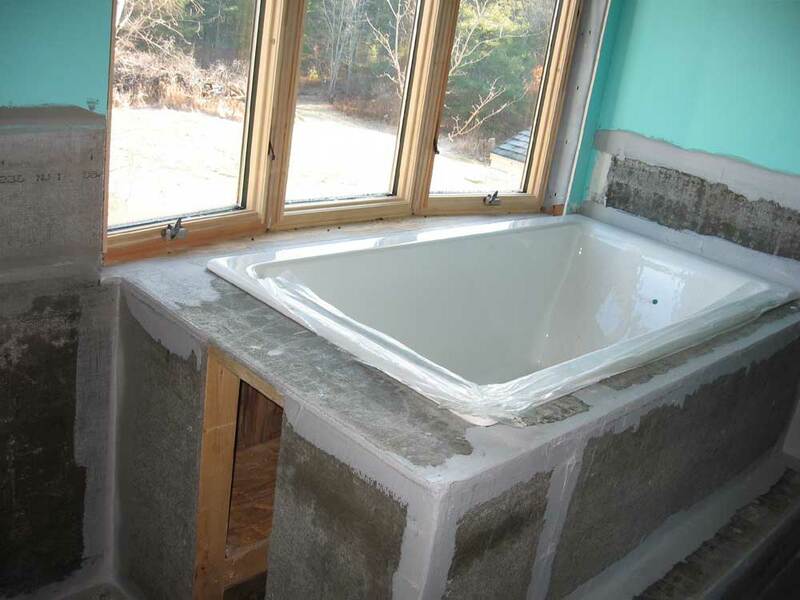 Using premixed thinset mortar (I caved in and decided I didn't want to mix any more mortar from dry--I hate it), I began in the shower enclosure and mudded and taped all the seams and corners, using fiberglass mesh tape. This took an amazingly long time, and a surprisingly large amount of my supply of thinset. It took around 2 hours just to do the shower area. 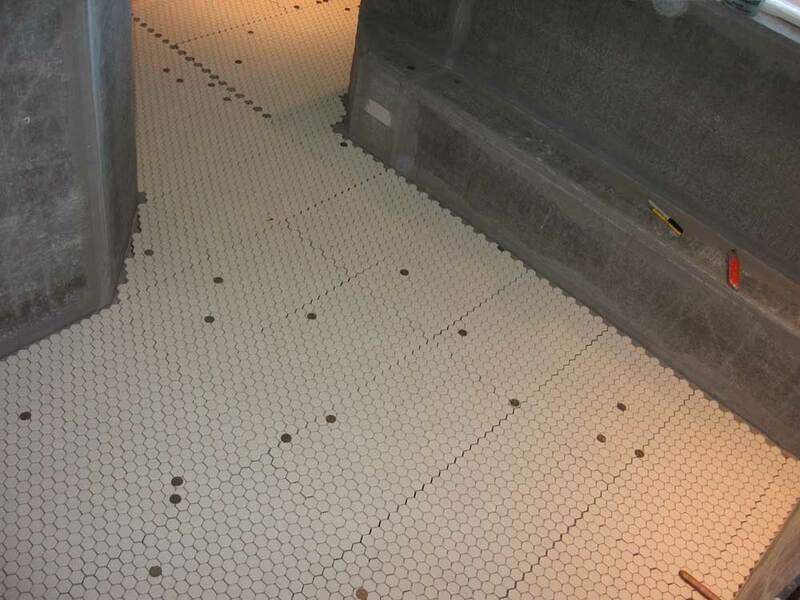 It was clear by now that the one bucket of thinset that I had would never be enough to complete the entire job, much less leave me enough to install the floor tile. So once the shower was done, I concentrated on the floor seams, so that at least I would be ready to do the floor tile whenever. 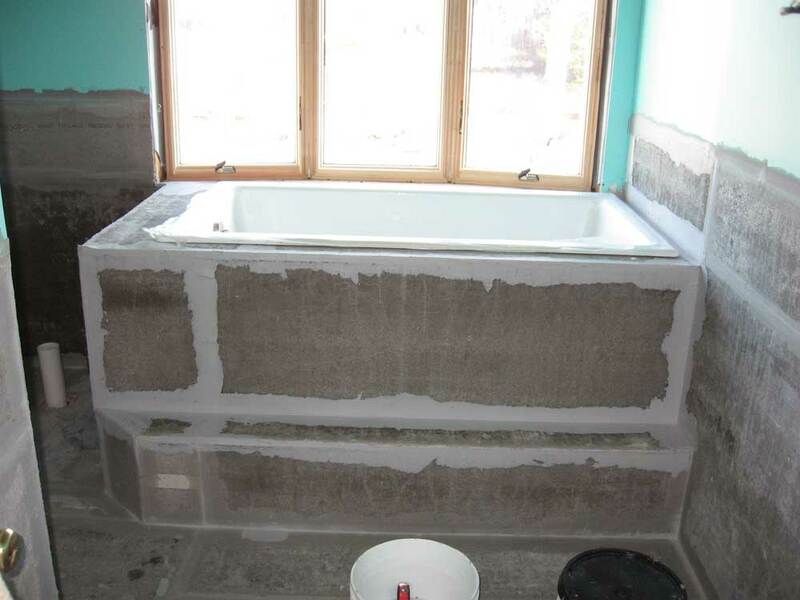 I had enough of the mortar to mud and tape a number of the wall seams as well, but I couldn't begin to address the tub surround. I just managed to have enough mortar for my final seam, literally scraping every last bit out of the bucket in order to complete the job. Since I had to pick up tile anyway, it was no big deal to need to pick up additional mortar; I needed other tiling supplies as well, such as wall grout and mastic for the wall tile. 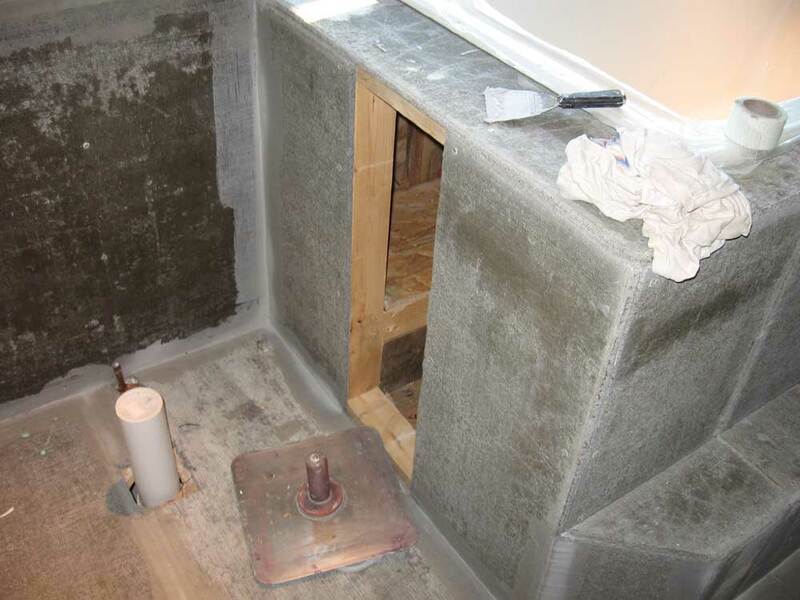 I also needed some mortar to build up my shower pan above the flat cement board floor in the shower; the pan would have to be slightly contoured to allow for drainage to the center drain. I was not looking forward to this job in the slightest. Next: more mudding, and the beginnings of floor tile and beyond. 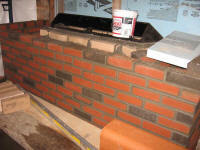 Here are some fresh photos of the chimney progress. 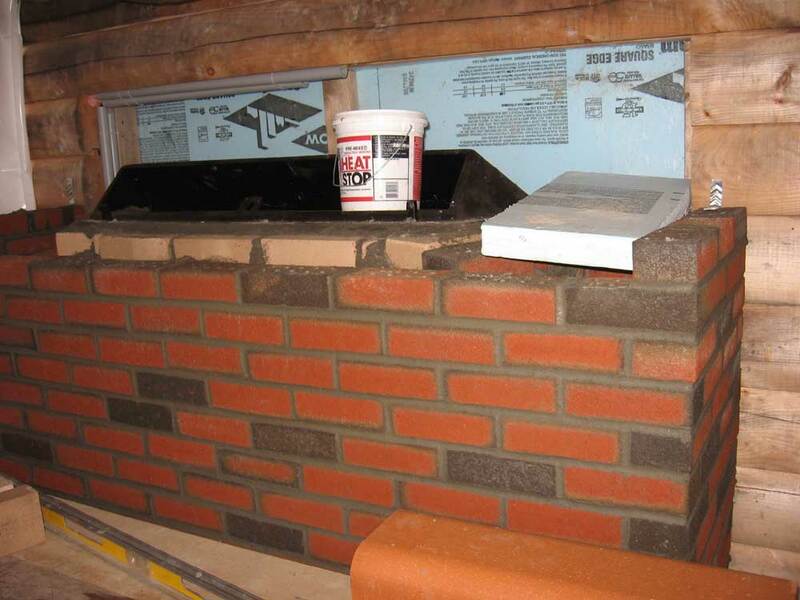 The underpinnings and firebox are complete (that's the yellow brick in the interior of the chimney), the damper is in, and the exterior brick laid up to about the base of the damper. As you can see, the chimney still has not progressed past the point of the opening in the house wall, but it's getting closer. I think (hope!) that this area, with the complexity of the firebox and all, is the slowest section, and that the bulk of the chimney will go much more quickly from here. What a difference a week can make. 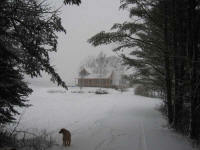 Last week at this time, we were fully involved in winter: snow and cold, icy wind. Yesterday set record warmth across the state, with temperatures at or above 50. Yes, this is mid-December. Today's a bit cooler...only in the 40s. It's mud season. Yuck. 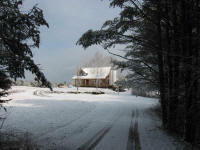 The day started out cold and with an extremely heavy frost--so heavy that it looked almost like snow. 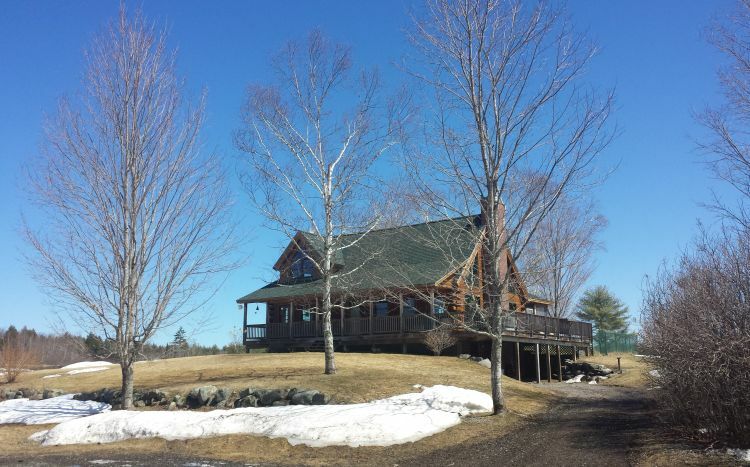 I worked in the shop for an hour or two in the early morning, but by about 10 the day had begun to warm up as forecast, and with bright sun and no wind, it seemed as if I had no choice but to continue work on some of the exterior house projects. The priority continued to be the back side of the house, which required the most work, and where the staging was already set up. I thought that installing the pine trim on the upstairs windows would be a pretty straightforward task. 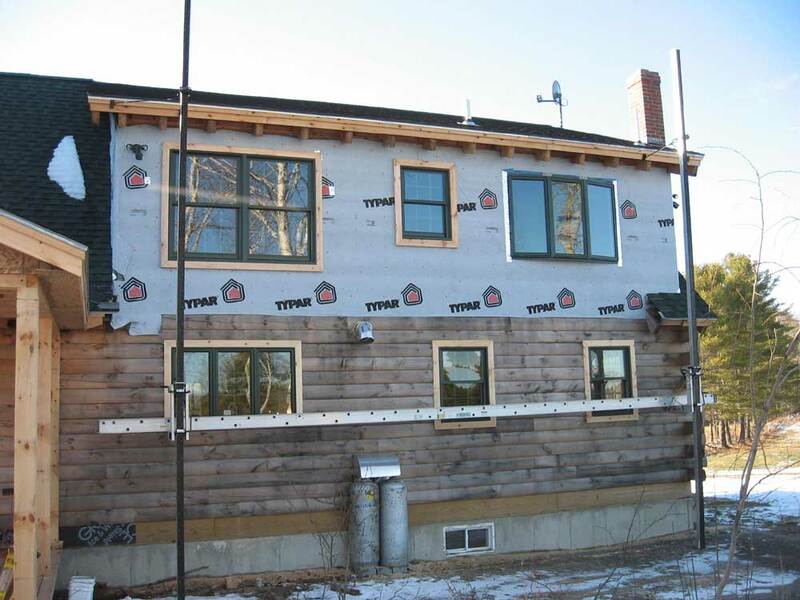 I began with some of the Pella Smart Flash rubberized flashing tape, which I applied around the edges of each of the windows, covering and sealing the plastic installation flanges and nail holes. 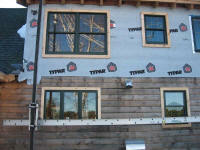 Since these windows were in a framed stud wall, I fortunately didn't have to mess with the router to install the trim. Still, everything takes longer when located up so high, and as good as the aluminum pump jacks are, it's still a wiggly, jittery proposition up on the plank, and one must move with care. 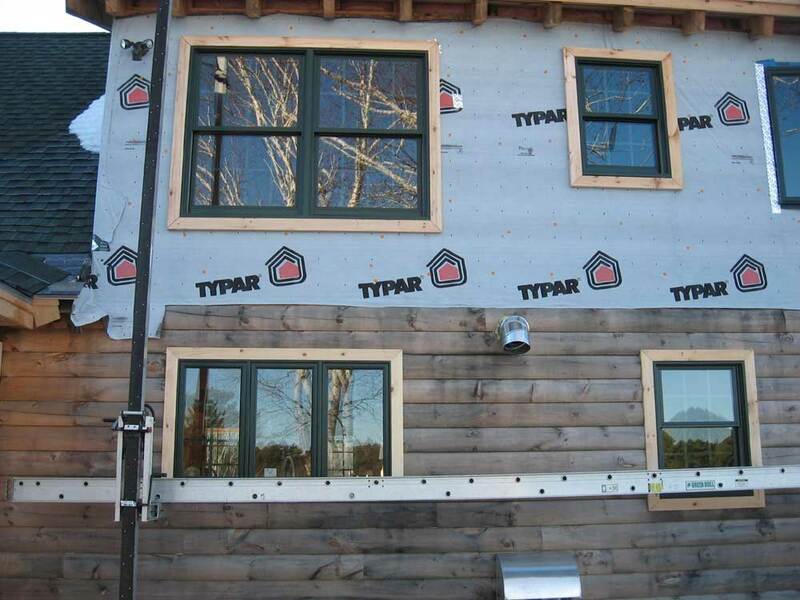 On these windows, the specs call for 2x4 pine trim; once the log siding is installed, the look and heft will mimic that of the 5/4 trim installed on the trim in the log walls beneath. I measured for and cut the trim as needed, and nailed it in place. Quite simple, really, other than the need to clamber up and down off the staging and into the basement to cut the trim. The bow window in the bathroom would require additional framing work in order to trim, since I needed to build a small roof over the top and do something at the bottom. So I didn't install any trim here, though I did flash the sides of the window (I had installed rubber flashing tape at the top of the window on the day of installation a couple months ago). It took a couple hours to complete this job. I called it a day then, since the next job on the back of the house is to build the small roof section that will connect the gable roofs on either side, and really finish off the appearance of the house here. But that requires a lot of prep work, as I need to pre-cut a series of false rafter tails to support the roof, and other work. That's a job for another day. 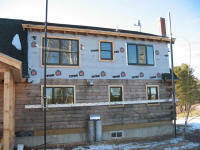 Once that is done, I can begin the actual siding, and wrap this part of the job up (I hope). With only a few effective hours to work, though, between limited sunlight and the need to let any frost or ice melt off the aluminum staging plank, it's a challenge to get anything done on the exterior. It took 6 hours, but with the help of my friend John we managed to figure out some vexing problems with the seemingly simple task of installing a router for my Internet connection, so that we could get Internet up to the house. I am not going to go into details here--it's exhausting, boring, and there's no real call for it--but after many hours of playing around with the setup, we managed to get the wired router to work down in the office, from which we could set up a wireless router for the house, and then also mock up and test the wireless Q-Bridge setup that we needed to beam the signal from the barn to the house. We found some really odd things going on that defied all logic--even more so than one might come to expect when working with computers. We did try the signal strength of the wireless router when it was set up temporarily in my office at the barn, and it worked fairly well up to about half the distance to the house, after which the signal began to degrade quickly. Still, the simplest solution was worth a shot, and despite not being powerful enough to go the whole distance, the performance was impressive nonetheless. Eventually, we set up, in a very temporary fashion, the Q-Bridge components and got the Internet, and the wireless router, to work at the house! There's more fine-tuning to be done, and the various components need to be permanently positioned and so forth, but at least it's all working. We got some more snow today--a smallish storm that nevertheless seemed to come from nowhere, at least as far as yesterday's forecast was concerned. And considering that Thursday had been near 50° and sunny, the dramatic and unexpected change overnight was interesting, if nothing else. I worked on the upstairs bathroom. 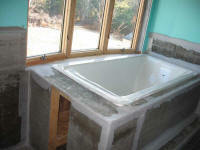 With some of our tile for the bath in stock, and more of the tile on order, it was time to wrap up the painting. 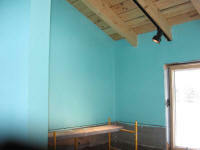 I began with a coat of drywall primer on the remaining walls. Earlier, I had run out of the 5 gallon bucket of primer that I had used elsewhere in the house, and on a trip to the store I picked up a gallon of another drywall primer, since I didn't want (nor need) another 5-gallon bucket. This was the only gallon I saw. 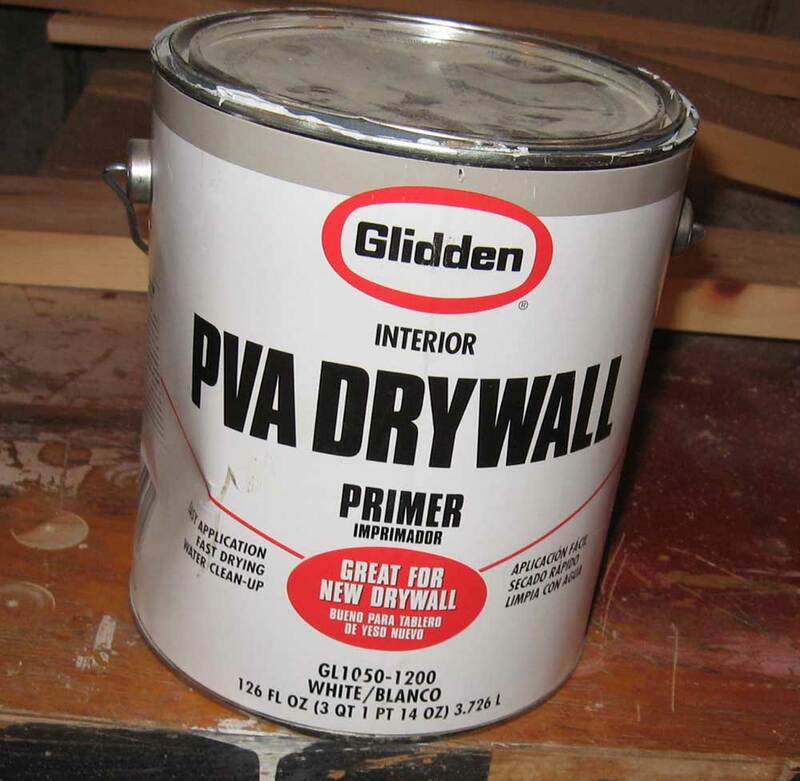 This Glidden PVA primer might be the worst single product of any kind that I have ever used. I have never seen a paint or primer that covered so poorly, spread so pathetically, dried so inconsistently, and as generally miserable to work with. To top it all off, it smelled really bad. Simply horrible, miserable, useless primer. 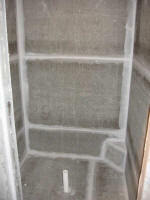 Nonetheless, I applied it to all the raw drywall, but it was far more difficult and time consuming than it needed to be. Primer is rarely a fun thing, but this was ridiculous. I hated it. 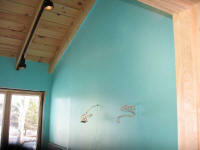 Once the primer dried, I moved on to the final coats of the very cheery teal color that we chose for this room. 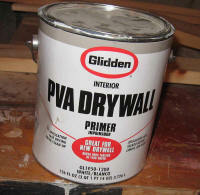 This paint went on nicely, of course, being a quality product. I had barely enough to do two coats on the remaining walls, but I managed to eke it out. It covered so well in one coat that I considered leaving it at that--knowing that I would be pushing it as far as the quantity remaining in the can--but the second coat always makes a significant difference, and I decided that I would probably make it with what remained. The dogs had a rough day of it today--a little lay time in the snow and then several hours of rack time. With what remained of the work day, after plowing the driveway (when the snow finally ended around 1-2 PM) and shoveling, I painted the shower ceiling with ceiling white, installed a lockset on the bathroom door and a few other small chores, including installing the recessed light bulb and cover plate in the upstairs shower when the paint dried and removing the drywall tape from the edges around the rafters. I was a bit surprised that something as simple as two coats of paint in this small room managed to consume most of the day, though there was some down time between coats and for some of the outdoor work. Chimney progress: Bob and Mike didn't work in the snow Friday. 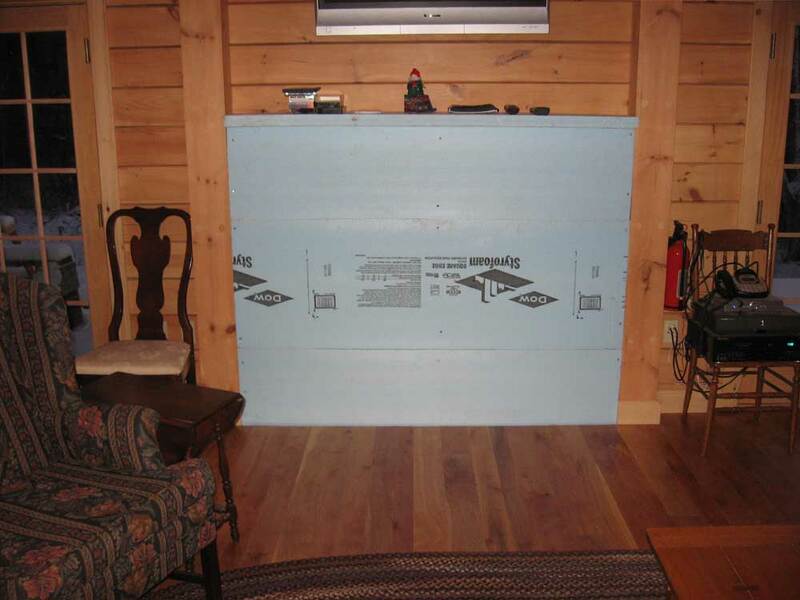 ON Thursday, they removed my temporary frame/insulation wall that I had built some time ago in the fireplace opening, cut out part of the floor, and sealed the opening on the inside with some blue styrofoam. 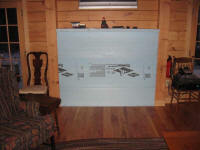 We even ended up with a foam mantle! All this so that they could continue work on the firebox from the outside shelter, minimizing the work that had to be done inside the finished house. Despite the extra help, work is still proceeding at a snail's pace. One of these days, I'll even get a photo of the progress from inside the enclosure. There's not much to report, but we did have our first snowfall of the season on Monday--a whopping inch, or perhaps a bit less. Still, it was nice to see the ground white. I snapped a few pictures of "baby's first snow". I'm planning to do some projects on the house over the weekend, but have been working in the shop all week. During the past week, I spent a bit of time, spread over several days, working on various aspects of the phone and Internet connections to the house. Last weekend, Heidi and I pulled two lengths of direct-bury Cat5e cable through the underground conduit leading between the power pedestal near the shop and the house. The direct-bury cable features a tougher outer sheathing, and the inside of the cable is filled with some sort of a waterproof material that is creamy white in consistency--sort of like Noxzema. I bought a 1000' reel of this, since it can be used for both Ethernet cables and phone lines. Pulling the cable required first replacing the thin string that the electrician had blown through the conduit back in September. I didn't trust this string to pull the cable through; breaking it would have been disastrous. I first tried pulling through some 1/8" cord that I had, but there wasn't enough of it to make it through. I tied the end to my bucket of polypropylene pull line, which is designed for this purpose, and then pulled through an entire length of this. I needed Heidi's help to feed the new line in, as it kept getting hung up when I tried by myself. I must have walked between the house and barn a dozen times or more during this process. Then, we pulled through two lengths of the cable, one at a time, pulling it directly off the spool. I pulled a second messenger string along with the first run, and then used the new messenger to pull the second run. I also included another messenger with the second run, so that there would be a messenger already in the conduit should we need to pull anything else for some reason. I had the phone up and running last weekend; that was easy enough, even though I didn't yet have the proper terminal block for the house end. I just twisted the wires together temporarily, and installed one R45 jack up in the house. I knew that the supposed limit for Ethernet cable runs (Cat5) was around 300'; it was something over 400' to the house, plus additional length to run between the pedestal and the Internet connection inside the shop building. I figured it was worth a try to see if it would work anyway, though--hence the second cable run. Unfortunately, it didn't work. The signal just wasn't strong enough for the computer to pick up at the house. Thanks to my John, I knew that another option was to use a wireless bridge kit to beam the signal between the barn and the house. So I ordered up the hardware, having tried the easier option first. As of this writing, I'm awaiting delivery of the Q-Bridge kit. I'll post details of its installation later--perhaps from a computer up at the house instead of in my shop office! I'm still working out a few connection details down at the shop, which are of no interest to you and would be time-consuming to write about. Once that's sorted out, and the Q-Bridge is installed and running, we should have Internet up at the house.